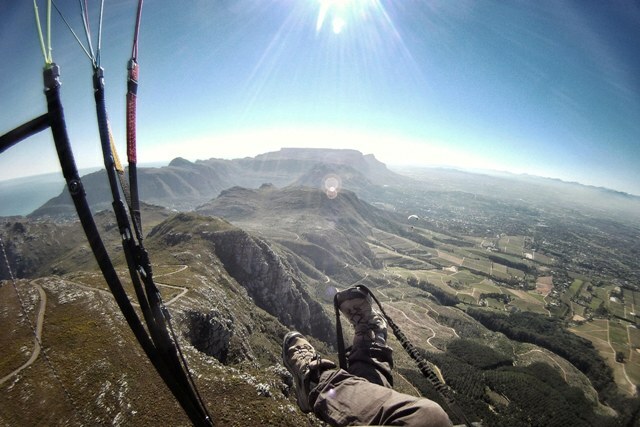 Stephan is the owner of Fly Cape Town Paragliding. He is an avid tandem, competition and aerobatics paragliding pilot He loves to share the joy of paragliding flight with anyone who is keen...He is also a qualified paragliding instructor and a paragliding endurance athlete. The South Westerly wind is definitely the best wind direction to have to paraglide from Lions Head. The image above displays the general airflow in a south-westerly wind. Paragliding in the South Westerly is pretty much straight forward. 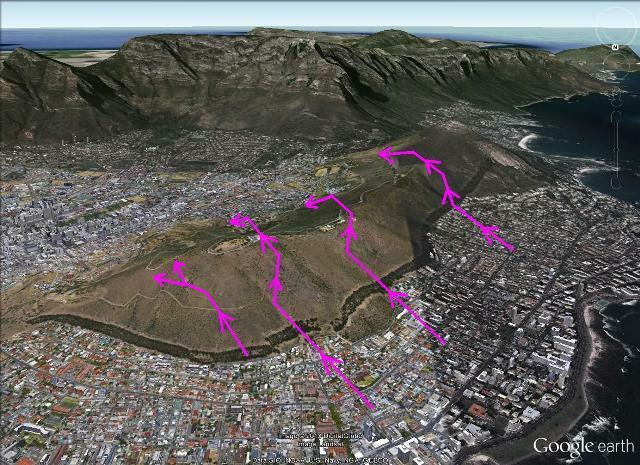 You need at least 15km/h of wind on the Top take off site for Lions Head to be soarable. If it becomes too strong to launch from the Top take off site you will face cross wind airflow from the NW on the bottom take off. The best way to take of from the bottom take off is by doing a reverse launch and making sure that the left side of your wing comes up first. The image above displays the area where you should fly in. If you stick to flying in the yellow circle you should have no problems to reach the summit and above in no time. Once you are above the peak of Lions Head you are now free to explore all other areas, as long as you are high above the peak. The image above displays the dangerous areas marked in green on the sides of the mountain. We often experience strong Venturi effect (as shown in the green marked areas) on the sides of the mountain when it becomes soarable. This wind can be strong enough to blow you over the back and get you into deep trouble. When taking off from the bottom take off, make an immediate right hand turn to move into the middle area of the mountain. The green X marks a big rock right in the middle of the slope. Start making a left hand turn when you pass the rock as you go down wind toward the dangerous areas of the mountain. You will see that it takes quite a while for you to complete the turn as you move closer towards the Venturi area. If you find yourself stuck in the Venturi you can apply the same techniques as discussed in Part 2 of the series. The same rules as discussed in part 2 also applies when flying out towards landing. Approach far upwind from the landing area. We often experience nice SW wind on the mountain only to find a much stronger Southerly wind at landing. By flying far upwind from landing when you are still high and then drifting back you will eliminate the risk of not getting to the landing field. You should always keep a look out for the increase of wind speed on the ocean like white horses or whitecaps. If you do see some white caps it would be best to rather fly out and go land. In part 4 we will talk about the various locations of the house thermals. So I decided to share the story of the great paragliding flight I was blessed with on the 9th August 2013 The forecast was saying Easterly wind which meant that it was not good for Paragliding Cape Town and unfortunately we had to cancel all our bookings for the day. The plan was to head out to Level 5 aka Raven’s Ridge. The take off site faces east and I knew for us to fly away from here, we would need to get there early. Jacques, Konstantin and myself met up with Long Pete, Niel Marx and Ian Cowie at the shopping centre in Steenberg at around 10 and headed up towards take off fairly soon after. Conditions at take off were perfect with a 15-20km/h ESE wind blowing up the front. Konstantin did not waste any time and he was in the air first with his porter Nicolas Majoni as passenger on the tandem paraglider. This was for experimental purposes to see if it was possible to take off from Level5 on a Tandem Paraglider. Within a few minutes Konstantin was gone and away working the ridge on the left that was baking nicely in the morning sun. It was my turn to take off next and with an easy pull on the A risers of my Ozone Enzo I was airborne. I made an immediate left turn as well and was finding it very easy to climb in the smooth ridge lift. I headed down the ridge towards Constantiaberg where I found my first good climb topping out at around 1200masl. I found that the wind above 900masl was now a rather turbulant 15-20km/h NE, so no time to take any nice pictures. I climbed on my speedbar and headed into wind towards Kirstenbosch, nursing my Enzo on the b-risers to keep her flying at maximum glide performance! At Kirstenbosch it was getting a little bit tricky as most parts of the mountain were now in the shade and lee-side on top of that, but on the other hand where do you find the best thermals?….in the lee-side of course!! I had to work very hard to stay up on every little sunny spot I could find and was slowly making my transition towards Maclears Beacon. At Maclears I was climbing nicely again and it felt like a bit of dynamic lift going up the vertical rock faces. The gap between Maclears Beacon and Devils Peak was now staring me right in the face so to speak and the choice to go behind Devils Peak onto Table Mountain front face was starting to look very appealing. I opted with the safer route, to push out front and climb on the Northern face of Devils Peak. Here I was rewarded with a mega climb back up to 1200masl, yay! I have never had the opportunity to glide straight over the City Bowl and I was not going to let this one slip away. I pushed my bar and headed straight to the buttress of Signal Hill. I arrived at Signal Hill with plenty of height to spare but was rewarded again with probably the best thermal of the day. This thermal was drifting back towards Lions Head and I connected with the NE face of Lions Head. I ended up soaring this face for about 10-20 minutes trying to figure out what my next move will be. I was not very happy with the rather fresh NE and was not going to attempt to fly the lee-side of the Apostle’s towards Llandudno. I was happy with my flight and decided to call it and spiral down to land at the field in front of the Bungalow in Camps Bay. After landing I received a phone call from Konstantin, he told me that Jacques turned around and top landed back at Level5 and they were busy driving my vehicle back to come collect me. I could not have asked for anything else……Absolute bliss! In this part we will look at the locations of the “House” thermals. Knowing where they are could be the differance between one of those absolutely magic paragliding flights or a short “foofie” which to me is a blessing as well…. The image above shows the house thermals on on the South-Western side. The two most reliable house thermals are the two coming from the two big rocks right in the middle of the slope and just below the path that takes you to the Top take off site. The image above shows the thermals on the South to South-Eastern side. Please remember that should explore these areas in a very well developed Wind shadow and make sure that you have enough height to make the glide to the designated landing area. 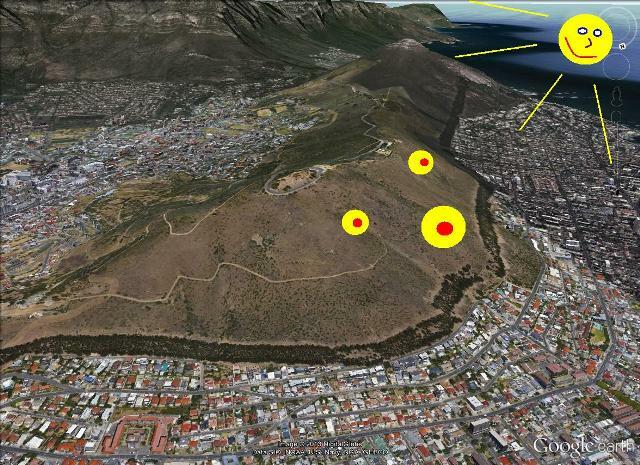 The image above shows the house thermals on the Western side of Lions Head. The strongest thermal can be found on the big rock right in the middle of the slope. In wind shadow conditions we often find nice gentle thermals over the rocky areas, especially in the morning as this side of the slope gets more sunlight. So firstly lets get things straight…. Paragliding is not the same thing as Skydiving, we do not jump, ever! Although the perception is that we “jump” from mountains we like to think that we fly. Well in fact that is indeed what we do, we do fly! Paragliders are designed to fly, we call them Wings. A wing has the ability to create a force perpendicular to the flow of air over it and against the force of drag, this aerodynamic is called lift. When we take off from the mountain the glide ratio enables us to glide around and look for more lift. Firstly for Ridge lift to form we need wind from a specific direction, a certain speed (between 15-25km/h and not more than 45′ side onto the ridge. The image above displays the areas of lift, as you can see lift is only formed in certain areas of the mountain / slope as well. The more straight onto the ridge (90 degrees) the wind the better the lift. The purple lines show the airflow, the air clearly gets forced upwards by the slope and this is where we find the best lift. We try to maximise our time spent in these areas of lift thus also maximising our time aloft. The only thing that keeps us aloft without finding lift is our glide angle, which means we are actually constantly going down. That is why we are always looking for lift. We do also use fancy in flight equipment to help us stay in the lift which we will discuss in the upcoming articles. In our next article we will discuss Thermic lift. The image above displays the sun baking the NW side of Signal Hill in the afternoon. The yellow and red circles indicate areas where the sun will warm some features more than others (such as rock-faces or large buildings), and these set off thermals which rise through the air. Thermals are columns of hot air that rise from the ground. As the sun heats air near the ground, that air expands and rises. When this hot air expands enough it will release either a column of rising air or “bubbles”. The air will rise until it reaches the same temperature level as higher up in the sky. The rate that this column of warm air rises depends largely on the “lapse rate” (the rate that air cools as it rises) and can be influenced by a number of things but mostly the surrounding air mass. This is why we experience the best time for thermal development in post frontal conditions. The green telephone cord lines indicate the flight path that the Paragliding Pilot should follow to climb in the Thermal. Once a pilot finds a thermal, he or she will begin to fly in a circle, trying to center the circle on the strongest part of the thermal or the “core” of the thermal, where the air is rising the fastest. Most pilots use a variometer, which indicates climb rate with beeps and/or a visual display, to help core-in on a thermal. Often there is strong sink surrounding thermals, and there is often also strong turbulence resulting in wing collapses as a pilot tries to enter a strong thermal. Good thermal flying is a skill which takes time to learn, but a good pilot can often core a thermal all the way to cloudbase. By now you must be thinking: Ok, we are about to go paragliding Cape Town but what type of paragliding equipment do you use and how much does one of these “baby’s” cost ? Well, lets start from the top. Why do we wear helmets? To protect your head of course, but mostly on the take off…. 2) The next two items are the harness’. One pilot harness and one pax harness. These harness’ are designed in such a way that it is possible for you to move from a standing position on the take off to a very comfortable seated position whilst glider flies through the air. The harness is also equipped with a foam protector and an inflatable airbag to protect your back should you have a hard landing. 3) The spreader bars are the bars that connect the pilot to the passenger and the tandem paraglider to the spreader bar. 4)The most important item of them all is the Tandem Paraglider. 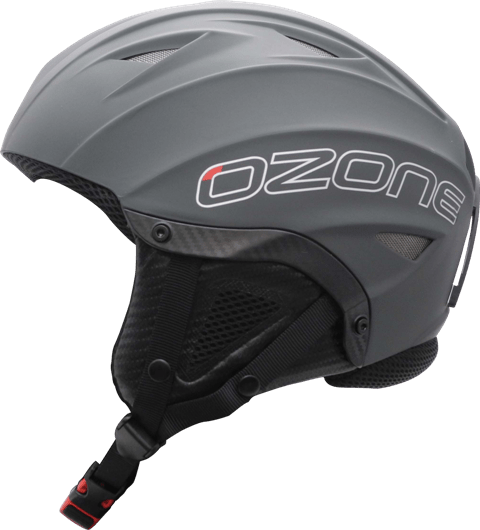 The gliders we use are Ozone Magnum 2’s. They are 41m’ in size and are made of the highest quality materials available. Definitely the best on the market. They have got a lifespan of around 300 hours. 5)We do also carry a reserve parachute in case the main tandem paraglider should fail or collapse, we can throw the reserve to ensure that we come down safely. The third type of lift is Wave lift. The image above displays the wind flowing over Devils Peak and Table Mountain. The air flows down the mountain on the lee side and then gets forced up again when it hits the ground. The air in the lee side of the mountain can often be very turbulent as the wind rotors in the lee side as it flows down the mountain. Wave lift is created by the obstruction of airflow in the lee side of a mountain, provided that there is a steady increase in wind strength with altitude without a significant change in direction, standing waves may be created. The lee waves occur near mountains and the airflow can generate standing waves with alternating areas of lift and sink. The top of the Wave is often marked by the formation of lenticular (lens like) clouds. Unfortunately this type of lift is not suited for Paragliding because it tends to involve high winds of 25 knots plus. This type of lift is well suited for hang gliders and fixed-wing gliders or sailplanes. The image above displays Betty’s Wave. The lenticular cloud can clearly be seen forming above the Cumulus clouds. In our next article we will discuss Convergence. In the last article on lift we will discuss Convergence. Spotting convergence lines or zones can be very helpful to Paraglider pilots as this means that you will go further on your XC flight and stay in the air for longer. The boundaries where two air masses meet are known as Convergence zones. 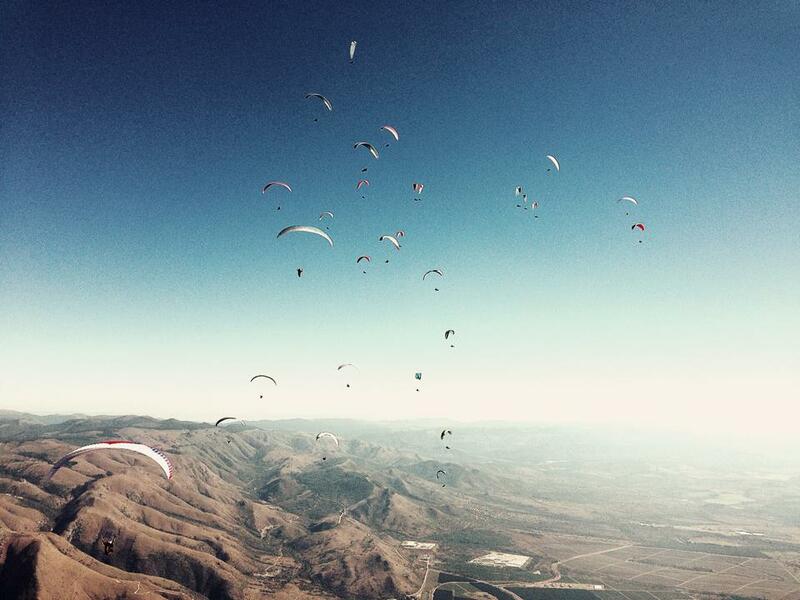 The image below illustrates the classic convergence line that sets up at our local XC paragliding site in Porterville. The convergence zone moves around and it depends on a number of factors like, the ambient temperature, the lapse rate and the strength of the Southerly wind in Cape Town. A Seabreeze is a wind from the sea that develops over land near the coast. In a Seabreeze front, cold air from the sea meets the warm air from the land and creates a boundary like a shallow cold front along a shear line. This creates a narrow band of soarable lift with winds as light as 10 knots (19 km/h). These permit the gaining of altitude by flying along the intersection as if it were a ridge of land. Convergence may occur over considerable distances and so may permit virtually straight flight while climbing or gaining altitude. The image below displays the airflow associated with a Seabreeze front. The red arrows indicate the airflow and the big Cumulus cloud the Convergence zone. All of the pilots that are employed by Fly Cape Town Paragliding is equipped with a Gopro camera that is attached to an extendable monopod for in flight pictures and videos. The Gopro camera is the worlds most versatile camera. The Gopro is the camera that started a revolution. Impossibly small. Impressively high performance. Incredibly versatile. It all adds up to camera that makes it easy for anyone, anywhere, to capture stunning photos and video of their life’s most meaningfull experiences. During your tandem paragliding flight your pilot will not only capture the breathtaking views but your smile as well. The placement of the Gopro on a extendable monopod makes it possible for your pilot to get that extra special shot. All of our pilots have taken thousands of in flight videos and pictures so you can rest assured that you will get the best possible in flight videos and pictures of your tandem paragliding flight here in Cape Town. Your in flight pictures and video will be stored on a re-usable SD memory card. You will receive this SD memory card should you decide to purchase your in flight pictures and video. Paragliding in competitions can be very intimidating and stressful for the inexperienced pilot but it can also be a very interesting and entertaining game played by the the experienced and properly prepared pilot. Preparation is probably the most important factor in ensuring a successful result in Paragliding competitions. You have to familiarise yourself with the flying site. Take a look at previous tasks that have been flown at this site on Leonardo. Study the tracklogs. Try to memorise the altitude levels of all the peaks on the ridge or mountain. Try to fly on the practice day before the comp. Speak to the local “Skygods”. Any advice from the locals can be extremely valuable. Make sure that you understand the task and that it is correctly inserted into your gps. Look at the map and try to visualize the task. It is very important to know where all the turnpoints are as well as the sequence. 2. Verify the number of waypoints and total distance of the task are correct. 3. Verify all cylinder diameters. 4. Set up the start and verify start diameter, EXIT or ENTRY START, and start time. Write down the Task on a piece of masking tape and stick this on your GPS instrument. Also make sure to add the turnpoint cylinder diameters and the start cylinder parameters on this task sheet. Harness, glider lines, reserve handle, flight deck and instruments, spare batteries, water in your ballast bag ( if necceassary), Camelbak filled with water, in flight snacks like Energade jellys, gloves, balaclava, helmet, sunglasses and suncreen. In the next article we will discuss the in flight tactics.